Succotash Cornbread Platter Salad photo courtesy of Amelia Cellar. These exercises use the platter, rather than the deep bowl as the canvas for creation to illustrate the universal process of creative thinking and design. The steps are the same no matter what your field. We’re using salads because everyone has some knowledge of salad and it’s a low-stakes easy medium for practicing everyday creativity. Plus, you’ll eat better and we should all be eating more salads anyway. For more background, read our introduction to Welcome to Platter Salad Creativity. Here’s a fun platter salad exercise that explores the use of summer salad ingredients. what other dishes make up this meal? Asking these simple questions engages our everyday problem-solving skills and develops our home cooking approaches. The situational constraints revealed by your answers will help get your creative salad brain in gear, which will help get the salad made. It’s important to view these constraints, these answers, as opportunities for creativity and action in the kitchen; they are not limits. Decisions get things done and get platter salads made and ready to serve. 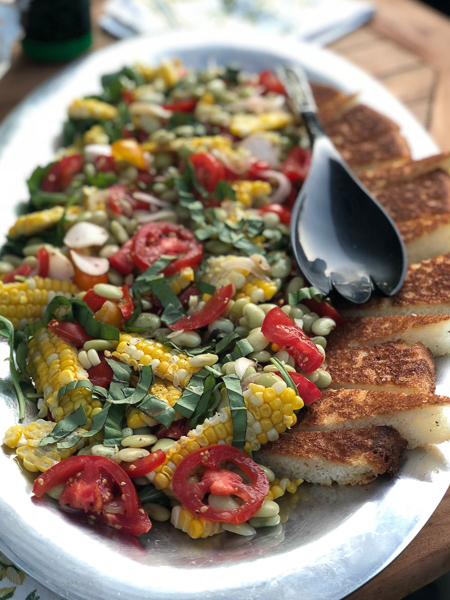 Q: What are the parameters for this succotash cornbread platter salad? A: It’s summer and we’re serving simple grilled chicken. Corn on the cob, cooked and cut into slabs (slabs look really cool, or pick your own shape!). See the note about corn slabs below. Lima beans, cooked just until tender, fresh or frozen. Frozen beans are delicious and handy so keep some around. Tomatoes — what colors and shapes look good to you? Sweet or spicy red pepper. Change the shape and size of the ingredients. Add or subtract an ingredient. Change the proportions of some of the ingredients. Change the focal point – make another ingredient the dominant one. How did that redesigned salad come out? What worked, what didn’t, what might you do for the next similar salad? Get in the swing of kitchen play and it will seep into other areas of your creative life. 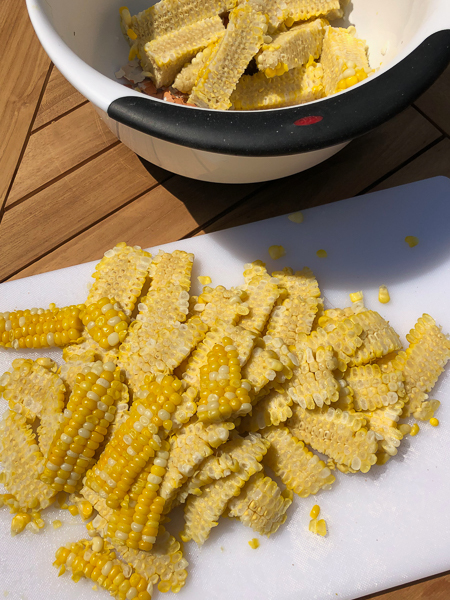 Note: Corn slabs cut from the cob are a handy summer salad collage component. They add a surprisingly bold shape to platter salads. Cut each cob in half and run a knife down the side of the cob to cut off the kernels and create the slabs. They’ll be jagged and organic looking (i.e., they’ll look REAL!). This method usually works like a charm, but every once in a while you’ll get an ear that just won’t cooperate. Don’t fret, just cut away the best you can. Use it as is and go with the flow of your design. Platter Salad Creativity is about creating in the moment and problem-solving within your particular parameters.